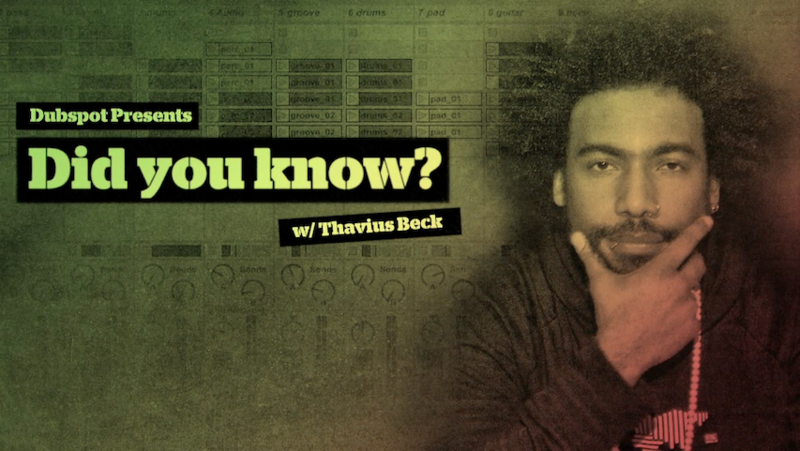 Dubspot instructor, Ableton Certified Trainer, and electronic musician Thavius Beck returns with a brand-new season of Did You Know? We launched the series back in January, and for eight consecutive Mondays, Thavius shared invaluable production advice, tips, tricks, and techniques and examined some of the less explored and slightly hidden features in Ableton Live. In this episode, Thavius shows you how to how to build your very own custom Slice To New MIDI preset, a very useful and efficient way to streamline your workflow. One of my favorite (and most used) features of Ableton Live is Slice to New MIDI Track, which allows you to take a piece of warped audio, slice it into smaller sections, and place those sections into either a Drum Rack or Sampler instrument. Normally when you choose Slice To New MIDI Track, you’ll see a dialogue box that gives you a few different slicing presets to choose from. These determine what effects and individual settings are used on the Drum Rack or Sampler instrument that is created to hold the slices. One of the most useful way to employ this technique is to make a preset for slicing drums or percussive instruments with a saturator and compressor, maybe with a delay I can adjust, and then make another preset for slicing more melodic elements that may have a low pass and high pass filter, reverb, and delay. Ultimately it’s yet another way to help streamline your workflow, and something that not many people realized they could do. So now, you know! After completing this program, you will leave with 4 completed tracks, a remix entered in an active contest, a scored commercial to widen your scope, and the Dubspot Producer’s Certificate in Ableton Live.